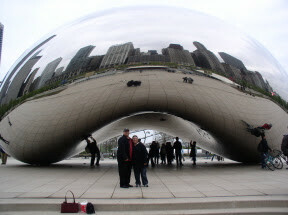 Me and Rey in front of the bean sculpture at Millennium Park. We have been having a blast after being delayed in Houston for 5 hours! Yes, we suffered through a horrible delay because of the weather. If you all remember, Wednesday's weather was terrible. We drove through the rain to the airport and couldn't find a place to park. We finally parked over in the International flights terminal and we ran to our flight. Thank goodness we had our boarding passes so all we had to do was check our bags. As it turned out, we were delayed for 5 hours anyway. Once in Chicago the evening event was over so we just grabbed something to eat and then went back to our beautiful hotel room. The Drake is such a beautiful hotel! If you go to Chicago you should definitely stay there. Thursday I was in the conference all day and Rey walked around all over town, literally. He ended up in the ESPN Zone but he got back in time for our evening event at a club, La Passage. Very cool place. The entrance is in an alley between Prada and Barney's. We had a really great time with the open bar and dancing. It was sponsored by Univision. Friday I was in the conference again until 2 p.m. Rey went back to the ESPN Zone until I was done. We checked into our much cheaper hotel, the Travelodge. Not a great hotel, but a really good location. Friday afternoon we visited the Buckingham Fountain, but it isn’t turned on until May. It was still very nice. It’s right on the edge of Lake Michigan, which is beautiful by the way. Did you know that it is the only Great Lake that is totally bordered by the United States? It isn’t bordered by Canada, like the other lakes. From there we walked over to Millennium Park. What a cool place!! There are two really interesting sculptures there. One looks like a big silver bean. We walked all down Michigan Avenue and looked at all the shops on our way to see the Picasso sculpture. Across the street is another great sculpture, Joan Miro’s Chicago sculpture. And around the corner is Jean Dubuffet’s “M0nument with Standing Beast.” Chicago has an impressive collection of sculptures. Then we went to Little Italy at ate at Frank Sinatra’s favorite restaurant, the original Rosebud. The Little Italy area is adorable. The houses around there are very nice. After walking around for a while and taking a picture with the Joe DiMaggio statue we had some coffee at the Starbucks. I knocked out really early because I was so tired. This morning we got started again and we went to a ton of places. We visited Soldier Field, home of the Chicago Bears. From there we went to the National Museum of Mexican Art. Very inspiring. Then American Girl for a gift for my daughter, Navy Pier, the Disney store, and the John Hancock tower. At the Navy Pier we ate at the Billy goat Tavern and Grill. 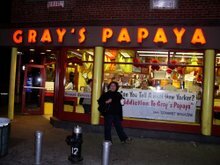 It’s the place that the Saturday Night Live skit, “Cheeseberger, cheesberger, chips, no fries,” is based on. After that the funniest thing happened. Rey wanted to go to the neighborhood where he lived as a baby. The way his parents have told him the story, the neighborhood was very ghetto with a lot of gang activity. What we found was far from that. Turns out that they lived in what is now called the East Village. It’s a really funky party of town, very eclectic and very much like our Montrose. Rey remembered that a guy that he met Thursday told him that there were some good bars on Division St. Rey checked his GPS on his extra phone and found out that we were right around the corner from where he used to live. We asked a couple passing by and they confirmed that we were right near Division and close to the bars Rey had heard about. We walked right around the corner and found a street lined with cute small bars and restaurants. We ended up at Phyllis’ Musical Inn listening to a pretty good band. Coincidentally they turned on the Rockets Utah game of the playoffs and Rey enjoyed watching that. We finished the night with pizza at Pizza Metro and then back to the hotel room so Rey could finish watching the game. Tomorrow we’re off back home and to the kids. I miss them! I am totally procrastinating. I have a To Do list written out, a packing list, and a grocery shopping list. I only have a couple of things on my To Do list checked off. The good thing is that a lot of items on my packing list are clean. I only had to wash my jeans and my shirts. Other than that I am the world's worst packer and I won't really get it done until Tuesday night. I know myself. I also have to pack 3 days worth of clothes for the kids because they're going to my sister's house. Why do I love to procrastinate? I don't really call it that. I say I have so much to do. Right now I'm washing a load of clothes and the kids are in the tub. Before they took baths we went to our meeting, I had a bible study with my student, we went to a congregation going away party and they painted crafts. I've been thinking about music a lot lately. I guess it's because I've been listening to Spanish Pop/Rock more over the last year, I started listening to the Dixie Chicks, and then I also started listening to very new artists, like Lori McKenna. It got me to thinking about my music history and I came to the realization that I got stuck in the 80s and I never got out. I have listened to 80s music my entire adult life. I occasionally listened to some other groups, like Mana in the early 90s. I also listened to some grunge in the early 90s. Basically I listened to the Singles soundtrack and liked it. Other than that I have not listened to anything new until now. It's kind of cool to finally come out of my 80s cocoon. One last note and then I will bid you adieu. I wish I could say more about this, and I probably will in a later post, but I don't have the time right now. Check out this super interesting history about my husband Rey’s (and now kids') ancestors. I want to make a scrapbook with all this information for the kids to use in school projects and reports. Won’t this make an awesome history project!!?? I told Rey that next time we go to San Antonio I want to visit Jose Francisco’s historical house at the Witte Museum http://www.wittemuseum.org/exhibits/longtermexhibits.html, the family cemetery, and of course the Alamo. I want to take pictures of all of these things for them to have available for reference and to use in projects. Francisco Antonio Ruiz was mayor during the Alamo and placed on house arrest. I'm starting to get excited now as the days are drawing very near. Rey and I are going to Chicago! I'm going to an advertising conference and Rey gets to come with me this time, which will be really nice. He didn't get to come last time and the time before that we took the children with us, which made for a very challenging trip. So we're both excited that we'll be going to together and without children this time. We have a great list of things for Rey to see while I'm in the conference and then together that weekend. Yay! Local author Gwen Zepeda will be reading on Thursday, April 19th at the Museum of Fine Arts Houston at 6:30 p.m. I unfortunately will not be able to be there, but I invite you all to make it out to hear her if you're in Houston. I LOVE LOVE LOVE the title of her event, "Mexican Women Were My Mister Miyagi." Isn't that the most awesome title? I think every person who grew up in the 80s understands that title. For a full schedule of the remaining activities check out nuestrapalabra.org. First of all it's like this. Foley's is no longer Foley's. It's Macy's. Therefore the old Foley's traditions no longer exist. That means no more mega shoe sale twice a year. Read all about it here. http://blogs.chron.com/shopgirl/. Second, I am an equal opportunity shoe buyer. I will buy a cute pair of shoes at Payless, if it speaks to me, the same way I will buy a pair of Franco Sartos. I meant to blog something all morning but I got caught up reading the news on MSN.com. That always leads me to looking up other things on Wikipedia and on and on. Between reading the news, eating breakfast, fixing breakfast for the kids, drinking coffee and changing diapers, before I knew it a couple of hours had gone by. So here I am. This Sunday was a slow start. Rey woke up, around dusk, sick, which is practically unheard of. I knew he wasn't well enough to make it to our morning meeting in the state he was in. My poor baby! I have plenty to keep me busy today with washing, folding, and putting up laundry. I started it all yesterday but I still have quite a lot to finish today. It's one of those catch up weekends. I still haven't gotten started on starting my query process again. Or my chapbook plan. I have a lot I need to get started on. The queries should be first because I will never find out if I can publish my book if I don't send it out there. Sad news. There will not be no Chica Lit Fiesta after all. The author, Alisa Valdes Rodriguez is very ill and needs to concentrate on getting better. It's on her blog if you're interested in reading about it. http://www.alisavaldesrodriguez.blogspot.com/. I think it was very brave of her to post about her illness because so many women do this and don't realize the damage they are doing to their body. Alisa's situation reminded me of my personal demon, the threat of diabetes that hovers over me. Very much like bulimia, and other self-induced damage, diabetics do the very same thing to themselves. I have people close to me in my life, relatives and friends, who are diagnosed diabetics that ignore the diagnosis. They continue to drink liquor and to eat unhealthy. I find myself doing the same thing, knowing that diabetes runs so strongly in my family. When I read Alisa's blog entry I thought of all of this. I thought of the irreversible damage that diabetes can do to our bodies. All of our bodies and it scares me. I think of my children and how when I was gestational diabetic I was so strict with myself for their sake. I took care of my body because they were growing inside of me and I wanted them to grow healthy and strong. Well now that they are outside of my body it should be no different. I should still want for them to continue to grow healthy and strong. I should still want for them to eat healthy like they did when they were inside of me. But most importantly I should lead my example. That is the #1 tip in this article. http://health.yahoo.com/experts/joybauernutrition/9974/10-tips-to-prevent-your-kids-from-gaining-weight. If I follow these tips I will not only help myself, by keeping diabetes away, but I will give my children a head start so they can have a better chance at a healthy adult life. We all want that for our children don't we? Meme from "The Game of Life"
I haven't done a meme in a long time. My sister sent me this interesting one. Please change each answer to yours and then copy, paste and send to me and the rest of your friends. 1. If you could spend one night alone with anyone in History, whom would you choose? 2. If you could suddenly possess an extraordinary talent in one of the arts, which would you like it to be? An extraordinary, indisputably good, publishable writer. 3. If you could commit one crime without being caught, what crime would you commit? I'd steal at least $1 million so I could retire to write full time. 4. If your plane were about to crash and you had time to write one quick note, to whom would you write and what would you say? To my husband and kids. I'd tell my kids how happy they made me and I'd tell my husband how much I loved him. 5. If you could run one single company, institution or organization in the world, which would you choose? 6. If you could have any view in the world visible from your bed, what would it be? 7. If you could have heard the deathbed confessions of one person from history, who would you choose? 8. If you could eliminate one day from your past so that you never had to live through it, what day would you erase? The day my mother died. I wish that day had never happened. 9. If you could have dinner with one person (famous or not, living or dead) whom would you choose? My sister who died 12 years ago. 10. What would be the last thing that you would like to see just before you die?